Ever been running late, your clothes in disaray, coffee nearly spilt, you get to the car only to find you can’t find your keys? The first step to keeping those jingle jangles organize is to get them onto a keychain and US Outdoor has a few options to do just that. A Brixton Key Chain loop made from genuine leather and a solid leather loop is just the ticket. 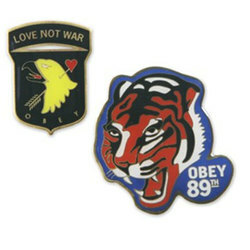 While you have your keys in check, make sure you accessorize with an Obey No War Pin or a I Love Boobies Bracelet (or two) a sign of your support and US Outdoor’s for breast cancer research.